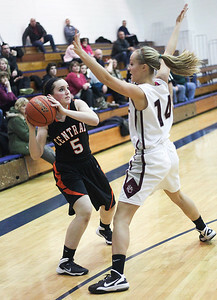 Sarah Nader- snader@shawmedia.com Crystal Lake Central's Maddie Helm guards Prairie Ridge's Aly Clark as she bring the ball towards the basket during the third quarter of the Class 4A Cary-Grove Regional on Wednesday, February 19, 2014. 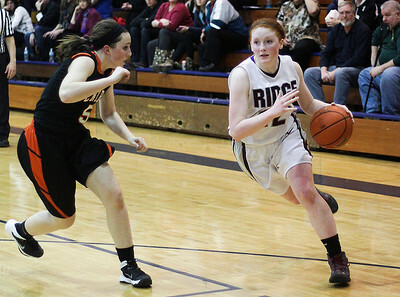 Prairie Ridge defeated Crystal Lake Central, 34-32. Sarah Nader- snader@shawmedia.com Prairie Ridge's Sarah LeBeau and Crystal Lake Central's Evelyn Youel run after a lose ball during the second quarter of the Class 4A Cary-Grove Regional on Wednesday, February 19, 2014. Prairie Ridge defeated Crystal Lake Central, 34-32. 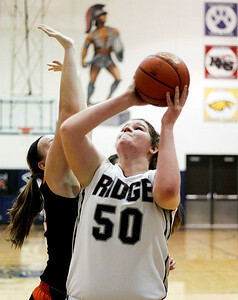 Sarah Nader- snader@shawmedia.com Prairie Ridge's Maddie Drain shoots during the fourth quarter of the Class 4A Cary-Grove Regional against Crystal Lake Central on Wednesday, February 19, 2014. Prairie Ridge defeated Crystal Lake Central, 34-32. Sarah Nader- snader@shawmedia.com Crystal Lake Central's Maddie Helm (left) is guarded by Prairie Ridge's Sarah Kilhoffer while she makes a pass during the second quarter of the Class 4A Cary-Grove Regional on Wednesday, February 19, 2014. Prairie Ridge defeated Crystal Lake Central, 34-32. Sarah Nader- snader@shawmedia.com Crystal Lake Central's Kristen Bernero shoots over Prairie Ridge's Maddie Drain during the third quarter of the Class 4A Cary-Grove Regional on Wednesday, February 19, 2014. Prairie Ridge defeated Crystal Lake Central, 34-32. 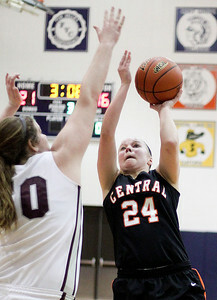 Crystal Lake Central's Kristen Bernero shoots over Prairie Ridge's Maddie Drain during the third quarter of the Class 4A Cary-Grove Regional on Wednesday, February 19, 2014. Prairie Ridge defeated Crystal Lake Central, 34-32.